The finish of every meal in such settings, as reminded by some of the commenters would be the final bits/morsels or what is literally polished off the vessel. And that is supposed to have wish fulfilling powers as we heard while growing up. Or it usually came with a blessing. When I was way younger, my granddad used to feed me sometimes. He, I thought at that time, was kinda slow. Or rather not as fast as paatti. Figured out, again in retrospect that he was just softer. But then he used to be the one saying "adikatti yaanaikutti". Paatti didn't bother about all those embellishments mostly. She would at times say dheergaayush. Once the ritual was over she would just circle the vessel/plate around my face and get up with an apppppaaadaaa. I have never heard that word that way from anyone else to this date. And then there used to be times, when I used to come home from school angry, or would bawl. That would be paatti's cue to say pasi vandhurthu.. saadhatha kalandhundu vandhu adaicha seriya poidum. The interesting thing is the treatment used to be same for Periamma and my mom too. If she saw someone getting the least bit angry the next thing we had food fed in our mouths. Inspite of mom's resoluteness there used to be moments where the rare tear would escape her eyes. Not much would be spoken. But things would be OK after such a session, whether it was 4 in the afternoon or 11 in the morning. And this ploy worked every time. Lesson here I think is when angry/upset, eat. Eat healthy. You can work out tomorrow. I was a silent spectator to many such exchanges. Paatti was not a great cook. Something or the other would not be right. But despite all that I craved for her weak kozhambus more than I would crave for a gourmet meal. When we used to say.. paattiiii kozhambu poarala.. idhu seriyala .. adhu seriyala.. but still eat nonetheless, paatti's standard response would be... yaen da kanna... seriyaadhaane panninaen.... And that would be our cue laugh. Then she would say enakkenna teriyum.. naan padikkaadha Jayam. Her name was Jayalakshmi. While we were in Mumbai, as a child I could speak only Marathi. Paatti could speak only Tamil. Nevertheless, God knows how we communicated. I still remember her teaching me the first letters in Tamil on a slate with flourescent green beading. Slate and Balpam. Thatha was very English. A thorough Gentleman. I remember when he lost the power in his legs that he could only drag himself around when he wanted to move. He was 90 then. But when someone came home to visit, I remember his saying, I request your permission to excuse myself as my body does not cooperate as much as I would like it. Age has caught up. Our visitor was struck dumb for a minute and then he found his bearings. But thereafter, I found our visitor visibly straightening, posture correcting and gave a little more thought to what he was saying. during the conversation thereafter. That was another lesson learnt that day, we learn by example. No matter who/what/where the example is (from). Even at 80 Thatha was particular about walking from our residence in Besant Nagar to my aunt's in Adyar. Definitely about 4-6 kilometers if I am not mistaken. And he was extremely brisk. He was my hero. Still is. He spoke immaculate English, was a thorough Gentleman. I have heard people in my family say he had a temper too. But I don't remember any incident personally. The problem is when you grow up with a man like this and then you look around, most of the men do not measure up. Neither intellectually nor in bearing. A Kate and Leopold setting would work perfectly for me. Ah well. It would not be rare to hear grandparents say they are having one foot in the grave. Or that its not long before they go and things like that. A lot of times, I have heard ladies in my family closer to their 70-s or 80-s wishing that they leave their mortal shell a sumangali. In this case thatha would categorically, and at times, vehemently tell paatti that there can be none of this. And that he cannot exist without "my dear wife" as he used to refer to her often. Sure they fought quite a bit too. And then, paatti would also say enakku sumangali a poga vaendaam. Avara enna maadiri yaarum paathukka mudiyaadhu. Paravailla, She would say. Thatha had his wish. He was 92. Paatti was 81. And in the recent Thayir Saadham episode, Maami reminded me of the traditional finish of the meal. With the last bit of the thayir saadham came the blessing, Maharaajiya, amoghama manasukkaetha maadiri vaazhkkai amaiyanum. I write a lot of such things not only with the intent of sharing, but also with a selfish intent of immortalizing these memories. And that is why there are in the WWW. I might not be blogging forever but hopefully I would have a backup of all this. And it would serve to refresh my memory. And be a parent as my mother and grandparents have been. One of the biggest traditions of transfer of knowledge is the aural tradition. Our country has thrived on it. For most of us who are blessed to have our grandparents around, even if some of the things they say might seem boring, they will be the memories that you want to refresh when you want that familiar warmth creep in to your heart. Your first award, your first achievement at work, the most of your first anything else has a tendency to pale in comparison. Listen to them speak. Spend time with them. And most of it is applicable to parents too. Our parents still have a first hand experience of the era gone by. And they have the wisdom transferred in them in most cases. And just as time takes people away from us, never to return, the only thing we would be left with are memories. And when you are reminded of them, its like you can see them again and can hear them again. And the blessing at the end of a meal is as real as you want it to be. Your lines are so heart touching.. My paati has got her hand fractured falling down in bathroom and being admitted for treatment today.. Your post reminds me of how much i owe to her and i'll do my best to take care of her from now on..
More often than not, today's thathas are too good in their English.Not only do they possess a great command over their language, but also, their diction is often to be admired.Blend of perfect accent with their choice of vocabularies reflects true professionalism in them.The community of "lawyer thathas" deserves a special mention, for the way in which they make the language their slave for expression of thoughts and facts. its sooooooo warming and charming to read the thatha paati things. And...after writing...i use to clean the slate by licking (yuk.....! )hahahhahahaha...for which i use to get blows on the back from appa. And ....'adivennai...aana kutti' is always 'amrutham' that nothing can match for that. Memories are very precious! So often all of us take many things for granted but hey, at least we are trying our best to make the most of! that matters! Simply loved this post of yours!! The words just seemed to be flowing just as it would when one speaks them from the heart. Am sure u'd ve watched the movie-subramaniyapuram...it has a touch ablaze the tinge undermaze which strikes an instant chord of attraction to the audience of this age(though i din like the end)..its coz the audience feel transported to a less polluted less hectic more calm n more peaceful kind of the 80's..
this write-up has a similar kinda feelin that makes me imagine how ur childhood wouldve been..
Grandparents r an asset to any child not just in childhood but also wen he steps into and keeps leading an adulthood(sumtyms even sans grandparents).. Thank you so much for this lovely blog. I have always wanted to blog these kind of memories,though right now all i have is diary works. One thing i always feel is that they lived/took life easily. Anyways, nice blog once again. Would love to re-read this in the future too. It's good to know about the history behind thayir saadham! People get wiser with age. I don't know how they also become more modern with age. My Grandma for e.g. used to be more open minded about the cultural changes that have taken place over the last decade than my Mom. I loved this post of urs. You reminded me of my grandparents. I am my grand mom's best grandchild. She loves me so much and so do I.
I Wish i could have started listening and in fact being open to her much earlier. Anyway I can start doing that now onwards! :) These are simple pleasures yet brings immense happiness. I have become a major fan of reading ur blogs. I totally love the way u write! I have learnt lot of new words from ur blog :) I already feel i have spoken to u... Keep writing such memories of urs!! Leaving these memories in the WWW is good for we the readers too. We also can cherish these likewise moments that happened in our lives. Nice write up feels like it is directly from your heart. Blessed are those who have the company of Grand Parents. Most of our values, culture and attitudes do get transfered, un knowingly though, from them. I could see the extent to which you have endeared yourself to them. People do eat(junk stuff) when they are upset/stressed/angry and end up being obese.But you have said it right...EAT HEALTHY. This is something I can't relate to, as I've never lived with any of my four grandparents. Fact is I've seen only one of them, that too till I was seven. PS: When angry or upset, Eat. - That's KungFu Panda policy too! A wonderful read indeed. I still remember my grandma telling me stories of how she met my tata. Ohh good old days... I miss being fed by her..
Brought back so many memories. Reminded me how lucky I was to have spent time with my grandparents. Called up my paati after a long time. Though she couldn't hear properly what I had to say, we didn't have much to talk about it put me at ease to just call. Both my patti's are still around and infact staying with us. My Thatha passed away a year before my daughter was born - I love them so much, thoughts about my grandpa still brings tears in my eyes. I'm glad that my daughter also has got to stay with my grand mothers, play with them and listen to stories from them. Your rendition on Thayir Saadham reminds me of the days when we (five brothers) sat in a circle and eat all the sadhams given on hand by my grandma. She would tell stories and give us in circles. My last brother was too young to eat with his hand and would have the privilege of sitting on her lap to be fed by her. He would still insist that a small quantity is kept in his which he would "poosify" over his mouth. And I don't know how they referred it in your house, the last bit remaining is called "கொக்கம்” in our house; there would be a fight between us for receiving that as that would be the most delicious serving. 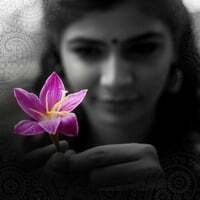 You have evoked great memories, thanks Chinmayi! I grew up in Delhi but every summer we would take the GT Express to Madras and spend two blissful months with my Thatha and Pati at their Bazlullah Road residence. We used to call them Madras Appa and Madras Amma to distinguish them from the other pair of grandparents. Looks like we had similar experiences in terms of food. The most memorable episodes, food-wise, were of Madras Amma seating a bunch of us cousins in a semi-circle around her most evenings and ootifying thair chadam out of an enormous vessel. She would make a small depression in each vaayu and pour into it a bit of saambar or kozhanbu-of-the-day. Fantastic stuff - especially the final bits/morsels which would come with a slight variation to what you mention... "adikozhambu yaanaikutti pole". Fantastic stuff! Whoa! I just scrolled down to read further and spotted your original Thair Saadham post... amazing parallel down to the small kuzhi! Or should I not be too surprised; maybe this is a standard privilege for kids in Madras/Chennai?? Having got same 'treatments' from granny/mom- i exactly understand the emotions u had gone through while penning this post! i still tell this to my mom 'my being over-weight is all because of u'r mom saying achchukozhambu aanakutti pola"! my granny was the best cook in the whole world! there is no one in this world who can make sambhar like her! bt the best part of her pampering me with her food- her stories! They always used to be in 1st person.. like- it was never "oru oorley oruthar irundaar.." it was "enga naatley- enaikku 10 praayaaththula.."
and her stories were brilliant.. she was a keralite.. so all her stories would have kerala in it.. her father was a namboothiri.. i had gr8 time listening to her stories of varma/artha jaama pooja/exorcism.. :) loved them! my dad is a gr8 cook/story teller too.. but granny is still the best! i miss her! thanks for that wonderful post!